with good ole bacon is in this cookbook. "Bacon Wrapped Ginger Soy Wings"
Thanks for adding my bacon wrapped meat loaf balls to your book! 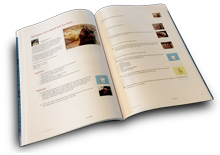 Thank you for including my recipe, your cookbook looks wonderful.